I hope that at least some of you are still checking the blog for updates despite my absence over the last few months. Profound apologies for the silence all this while, and without trying to offer a plaintive explanation for it, I was and still at very occupied with the intense work related to another, equally Trivandrum-related venture. You can read more about it on its Facebook page. The best way to kick start the blog is with a happy post about a piece of news that a lot of us have been waiting for a long, long while now. A piece of news that has won an election, galvanized public opinion on Social media and in the streets and sent shivers down the spines of vested interests near and far. Yes, ladies and gentlemen, the Vizhinjam project finally has a developer, after years and years of failed bids and protracted wrangling about the most recent tender process. And the best part is that the winning bidder is Adani Ports - India's biggest private port developer, owner and operator and possibly the only India company with the capability, experience, global partnerships and the deep pockets to develop and successfully operate India's very first deep-water, container transshipment terminal and Kerala's only deep-water, multi-cargo port. A few hurdles have been crossed but many lie ahead before the first giant container ship, hopefully a behemoth of the MSC Oscar class (Adani Ports has a strategic tie-up with the Mediterranean Shipping Company that owns the world's class of largest container ships and whose terminal arm operates at deep water container terminal at Mundra, as well as with with CMA CGM - another global Top 3 container line). Incidentally, Adani Ports and MSC have already set the record for the largest container ship to call at an Indian port, when the 14,000 TEU capacity MSC Valeria called at Mundra in mid-2013. The MSC Oscar class carried almost 50% more containers, and other ports in India, can only dream of accommodating such giants. Kudos to Dr. Shashi Tharoor and the Chief Minister, Sri. Oommen Chandy for standing fast in the face of massive opposition, both from within their party and from external political forces, and going ahead with issuing the Letter of Acceptance to Adani Ports. Fingers crossed for the weeks and months ahead before construction starts on India's first ever deep water, container transshipment terminal. The Curtain Falls on the Best Ever National Games! After two weeks of spirited competition, and packed venues that showcased amazing participation from the people of Trivandrum and Kerala, the 35th National Games of India have drawn to a close in Trivandrum. Kerala triumphed as the Best State with a total of 162 podium finishes, including 54 gold medals. A proud achievement for a State with just 3% of the population of India. 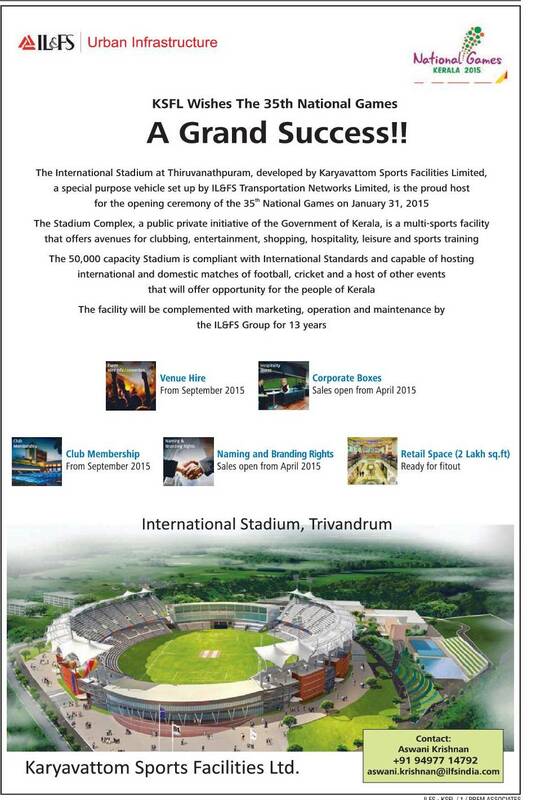 Post by National Games Kerala 2015. But the people of Trivandrum which hosted the vast majority of events including the Opening and Closing Ceremonies and the Athletic competition can be especially proud with how enthusiastic their support has been to the National Games. Every venue was packed every day and the sportspeople were often cheered on with the kind of passion usually reserved for cricket or football. The 35th National Games hosted by Trivandrum have been widely heralded as one of the best ever held, not just in terms of the level of spectator enthusiasm and the quality of the competition but also in the world-class standards of the facilities. National Games done! What next, the Asian Games or who knows, the five circles.....?